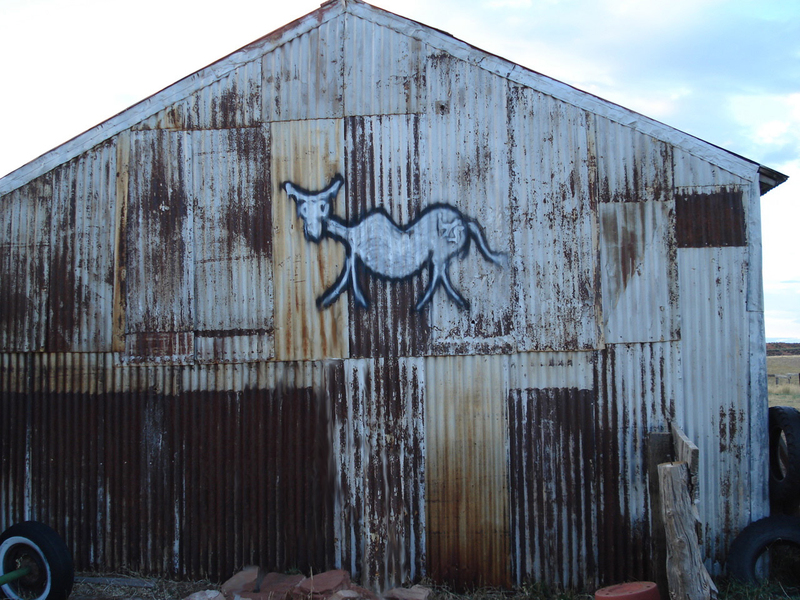 “Cow Tag”; spray paint, old barn, prairie, railroad tracks, trains, graffiti tags on railroad cars; 2008. I grew up near the Union Pacific railroad line and watched railroad cars tagged with graffiti from all over our country roll on through the vast windy prairie of southeast Wyoming. I always wondered where they were tagged and by who, and if they had any idea of the landscape their tags would travel through. Now that I live in Brooklyn I see some of the graffiti artists at work on this end of the railroad line. I decided to make a country tag to answer back to the railroad cars. This Cow Tag is about 14’ above the ground on the east side of my parents’ barn, facing the railroad tracks. The brand on the tag is further reference to how cows are literally “tagged” with a brand.